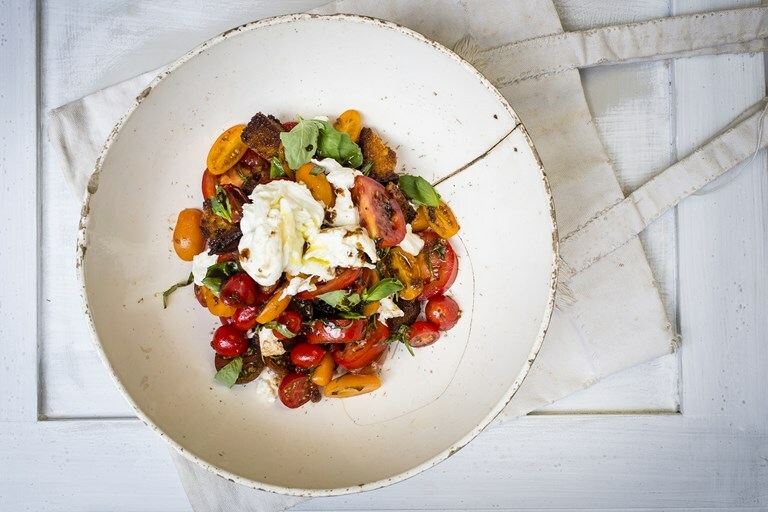 Nina Parker's Caprese salad is served with a punchy anchovy dressing, giving this classic mozzarella, basil and tomato salad an elevated twist. The key to this dish lies in the quality of the tomatoes, so only attempt this when they are perfectly ripe and juicy for the best possible flavour. This the salad of all tomato salads. There are many stories that date back to 1920 regarding this recipe, one of which mentions a version appearing in bread. Perhaps the most memorable is the story of King Farouk, the notorious gourmand, who asked for something light and refreshing as an appetiser at the Capri hotel, Quisisana. On his request, he was given a sandwich stuffed with mozzarella, tomatoes and basil. This sandwich later evolved into the classic tomato and mozzarella salad that is now served all over the world. Early on, cow’s milk mozzarella was used in the salad but these days it is often made with Campania’s buffalo milk. This salad is unmistakably Italian thanks to the colours representing the nation’s flag. Even though I adore the classic version, I find this one a little more memorable with its punchy dressing. Nina Parker is a London based chef, author and director of her own catering company, NINA Food. Her latest book is Nina Capri, a collection of recipes from Italy's Amalfi coast.